To say Twilight Creations had a hit on its hands when it released the board game Zombies!!! would be a gross understatement. It’s spawned numerous editions, expansions and sequels (along with numerous bags of plastic figures). So their tapping Midnight Syndicate to come up with a soundtrack makes perfect sense. 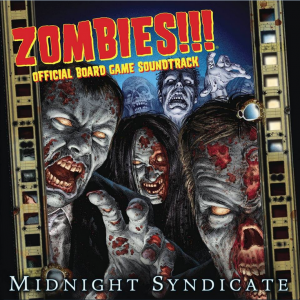 Who else would makers of a zombie board game with RPG-like elements turn to than the artists responsible for both numerous horror ambience and the official Dungeons & Dragons soundtrack? Mild reverb guitars and slow creepy buildup open “It Begins.” I love the piano work and percussion, along with how the overall feel track gets your skin crawling. So you could play this in a bug or spider room if you don’t want to stick with the album’s zombie theme. It can also work with other themes thanks to its use of different eerie touches I can’t quite place. One part sounds like jangling chains, so there’s definitely some dungeon potential. “Where Did Everybody Go?” uses soft and moody string work to create a feeling of desolation and loneliness. The thudding drums add to the feel. It also builds up as it goes along, complete with moaning tones, for a very loud finish. The pounding drums of “They’re Coming for You…” sound like a heart beat. Snippets of percussion and the sounds of shuffling and junk being knocked over soon appear. It creates the sense of following or being followed. A distant motorcycle and soft zombie sounds are heard before the music takes back the focus. The complete effect is something dangerous getting closer, so you could use this with other monsters besides the living dead. Why not try using it as the soundtrack for a room set up to look like a basement or storage room? The stored boxes could form a maze of sorts for the monsters to lurk in. You could also get away with passing off the sound of the motorcycle as the sound of a chainsaw. I’ll leave it up to you if you actually want to have a character menace visitors with a prop chainsaw. A gong strike brings us into “Slight Miscalculation.” You’ve never heard drums and strings used like this before! Although it starts at about medium volume, it gets louder as the track speeds along. There’s plenty of tension as creepy woodwinds and zombie sounds are heard. It creates the feeling of running…until the track switches gears by musically implying safety is found. Sounds like the perfect opportunity to scare people while their guards are down. “Last Day to Live” blends pianos and synth tones (along with some distant gongs and wordless female vocals at times). This is another track where the volume builds up, but it has lots of details which sets it apart from the others. I like how the vocals and piano play off each other later in the track. Percussion and synths with John Carpenter-esque feel join in. Then something weird happens. Although the music stops at 3:28, there’s a period of near silence and a soft eerie tone until the track ends at 3:49! The loud and rumbling opening of “No Escape” makes great use of string work. It’s all quite unnerving, especially the soft bursts of piano work. The pounding and horns make it feel like you’re being chased by a giant, so why not have a giant monster chase people in your haunt? Midnight Syndicate fans will recognize this as a shortened selection from the Axe Giant: The Wrath of Paul Bunyan soundtrack. The sounds of breathing and whispering have been added as well. “Town Square” is a soundscape of sorts that opens with storm sound effects, soft synth tones and wordless male vocals. Empty swings can be heard blowing in the wind and zombies are rattling metal fences. The music is appropriately sad and mournful given how track implies civilization is in ruins due to a zombie apocalypse. We also get to hear breaking glass, bursts of gunfire, wordless female vocals, wordless unisex vocals and a woman screaming in the distance. It’s perfect for use with an area made up to look like a deserted city street. Well, as deserted as a street can be when zombies are on the prowl. People will assume all the sound effects they hear which don’t match up with anything they actually see is supposed to be happening elsewhere in the city. I highly recommend including zombies restrained by a fence. The incredibly soft opening synthesizer buildup of “Zombie Master” gets very loud very fast once the strings and gongs appear. The drums and horns help give it a classic horror movie feel. Soft wordless unisex vocals layered in background are only one of the track’s spooky touches. Although it briefly loses its grand feeling for a creepy segment, it goes back to the epic feel for its big close. The heavy use of sound effects in “Raiding Todd’s Tool Shop” makes it feel like an audio drama without any actual dialogue. A gun is loaded and a little bell lets us know someone had entered the titular store. Suspenseful strings and drums play while our unseen protagonist walks around. The sound of another door opening leads to sounds of ransacking and a radio being turned on. It’s hard to make out due the static, but it appears to be a broadcast about shelters. The music stops and fades up once the radio is turned off. There’s pounding at the door and zombies are heard. They must have heard the noise! The sound of breaking glass lets the listener know the zombies have gotten inside. The person runs away, only for the track to suddenly end…only for a loud zombie snarl to act as a jump scare. The slightly shorter version of “Veiled Hunter” from The 13th Hour is still piano horror at its finest and its synth touches still remind me of Friday the 13th. It creates the sense of frantic running so it practically begs to be used in a slasher room or for when a haunt performer follows guests down a dark hallway. The tense, sweeping tones of “Into the Abyss” aid its epic orchestral feel. It feels like a taking a journey and you have to love the drum work. The string work and drum strikes go well with the wordless vocals. It develops a chase-like feel at first, only to quickly go back to the original feeling of grand menace. The moody opening “Alternate Food Source” leads to the sound of a creaking metal door being opened and a person walking around. As they check stuff, the sound of a shotgun reloading and a shell popping out can be heard. Slavering zombies and shaking metal can also be heard as the frightening strings and drums build their way up to the track’s climax. Similarly, there’s a soft, gradual build at the start of “Fear.” Light echoing notes and soft string work are aided by some violins in the back. Thunderous drumming and an intense beat take over, only yo lead to the crackling static of barely audible radio broadcast. But when the man broadcasting is eaten by zombies, the radio stuff goes away and the music grows into a frenzy. “Adrenaline Rush” has an appropriately intense feel thanks to its pounding percussion, pianos and strings. There’s lots of different percussion instruments on display and its gives something of a machinery or factory feel to the track. A motorcycle is heard (but could pass for a chainsaw) as well. The music fades as an out of breath man is heard trying to escape zombies on a motorcycle. You had better believe the music returns with a vengeance for the end. If you try using a chainsaw scare in a haunted factory scene or industrial maze in your haunt, you can get away with using this track. The super soft opening of “Dusk” ushers in light, steady piano work and backing vocal of the wordless female variety. Some zombies are heard at times, but the track eventually becomes a mix strings and (at 1:16) strange soft noise until the ending. “We’re Screwed” is another track with haunted factory or industrial maze potential. Machinery and steam are both heard among the pounding tones and percussion, along with some brief touches of piano. There’s also lots of breaking glass effects, clanking chains and ominous string work. In “Race to the Helipad,” tense tones and suspenseful strings play as a helicopter is heard. I love how the percussion is used to indicate urgency. Drums and strings make the listener feel like they have to run as fast as possible. This is aided by the sounds of a man breathing, zombies, guns and a hovering helicopter. Naturally, everything goes silent once said helicopter leaves. This is the sort of track which works better in a haunted trail rather than a haunted house. With all the effects going on, people might assume they’re hearing something from another part of the trail that they can’t see. The chance of hearing a helicopter at night without actually seeing it is also more likely outdoors and the trail’s patrons just might write it off as noise pollution from local air traffic! Zombies!!! Official Board Game Soundtrack offers plenty of material for haunted attractions of all kinds. But having zombies in your haunt admittedly makes things easier and I personally recommend selecting individual tracks to play. Its use of sound effects in certain tracks to tell a story might make it more difficult to use the album in full at a haunt than other Midnight Syndicate albums. But that’s to be expected since this was intended for use with a board game. It’s supposed to be like having a movie playing in the background for atmosphere, but without any visuals or plot to distract you from the game. In fact, it wouldn’t surprise me if the periods of silence I noted earlier were meant to give players a little extra time to concentrate or talk among themselves. Said periods could also be used as an opportunity to a scare when people least expect it. Other reviewers have noted the presence of tracks from previous Midnight Syndicate albums on this release. I haven’t heard all of the albums cited in that link, so I couldn’t comment on them all. What I can say is how many of these tracks now have sound effects and seem to have been altered or newly recorded for this particular release. I suspect this was due to timing issues brought on by a combination of their having released another album the same year and the preparations for their 2017 live show at Cedar Point’s HalloWeekends. But this isn’t the first ambient album about zombies with some tracks from the artist’s earlier albums and I only brought this particular up as a matter of trivia. People looking for an album with a zombie theme should definitely consider checking this out; it’s a no-brainer (and not because a zombie got hungry)! UPDATE: Midnight Syndicate got in touch with me to share some details about the album’s origins. It turns out many people who play Zombies!!! have been using Midnight Syndicate albums as background music for many years. This led to plans for a compilation album made up of tracks selected by fans and the game’s designers (along with a few new tracks). But as the project started to take form, it was soon realized more original material was needed to create the proper mood demanded by the game’s setting. The final product consists of 9 new tracks, 4 favorites from past albums and 5 newly recorded takes on old favorites (with new effects added in for good measure).